Conkerberry is a native of Central Australia. 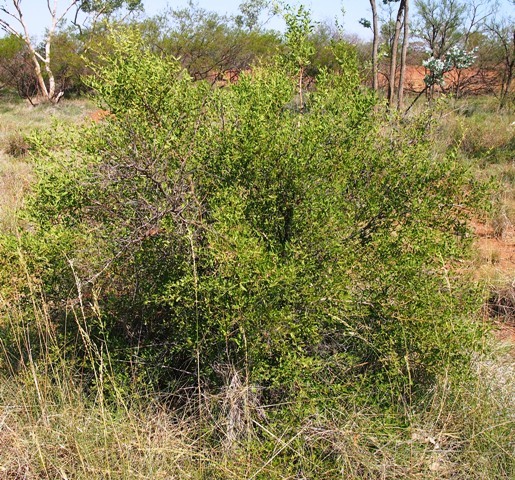 It grows throughout the drier areas of northern and central Australia on a wide range of terrains and soil types. However, in wetter parts it tries to keep confined to relatively wetter areas only. The plant is a multistemmed shrub, 1 to 3 m high and 1.5 to 4 m wide. 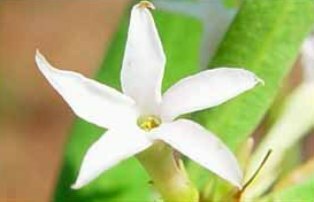 Leaves opposite, glossy green, opposite, narrow ovate to lanceolate, 1-5 cm long; hard thorns 1-5 cm long; flowers white, star shaped, 1 cm across. Fruit a berry, ovate, 1-2 cm long, which turns dark purple or even black at maturity. These are edible and have a sweet taste. 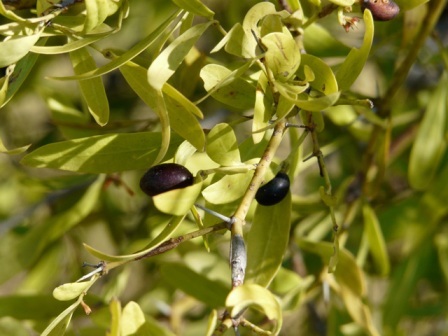 These are popularly eaten by the aborigine people of Australia. This plant also becomes a weed in Australian grazing lands. It can multiply fast by natural layering. In this case, it becomes a menace and is difficult to control even with herbicides.